What if you could almost literally get a look at the path not taken? What if you could consider the differences between the teen you and the adult you in stark contrast? Would you regret the choices you made? Would you change your life? "There's nothing wrong with my life. I should be happy. But there's this sadness... and I don't know where it comes from." “Blue Jay” is a gentle, genuine trip down memory lane that features one of our best actresses in the kind of role she doesn’t get to play that often, and another great turn in the arc of an independent film icon. It’s a two-hander through and through (there’s only one other speaking role at all and it’s minor) and the two leads are more than up to the challenge, giving so much to one another that we fill in the history of their relationship and the years they’ve spent apart. The final act has a twist that doesn’t particularly work for me (mostly in that I wish there was no revelation in that moment at all) but the performances are so truthful that it doesn’t really matter. There’s so much fine detail in the acting work, especially by Paulson, who was so drastically different in her Emmy-winning role on “The People v. OJ Simpson” that everyone who saw that should watch this just to see her remarkable range. Her take on Amanda contains so many subtle layers. There’s a scene early in their time at Jim’s home in which she just laughs and moves her body ever so slightly into his, conveying a comfort through body language, an underutilized tool of the modern actor. “Blue Jay” is a dialogue-driven piece, of course, but it works because of what’s unsaid verbally and what we get from a look by Duplass or a laugh from Paulson. They are both fantastic here, especially her. 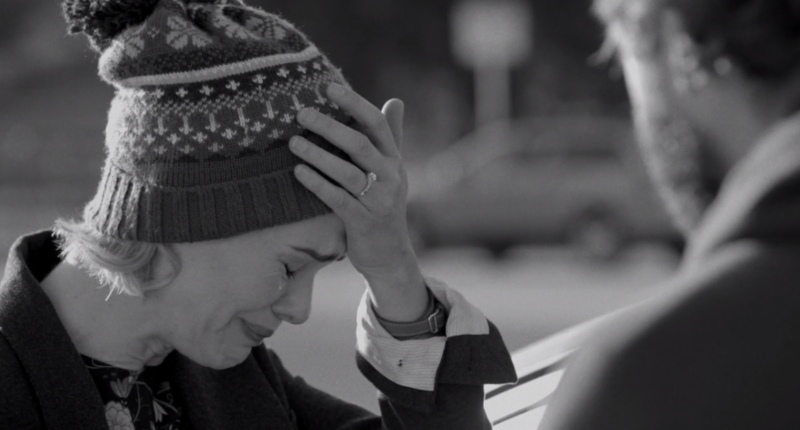 It’s one of my favorite actress performances of the year.